As promised, I wanted to blog about Ms. Tran’s re-opened court case with St. Mary’s International School in Tokyo, Japan. The unfair dismissal case that the teacher had brought against the school in 2008 was supposed to be finished in May of 2010 through a settlement. However, it resurrected, zombie-style, when Ms. Tran found out some disturbing news one day in November of 2010. This strangely involved a Professor of the English Department of Aoyama Gakuin University–someone Ms. Tran has never met. While many other teachers were resigned to complain behind closed doors, Ms. Tran escalated her issue until she got a resolution because last time anyone checked, Japan was a first world country. She took her problem through the school (useless), through the mediation of the Tokyo Government’s Labor Mediation (no teeth or jurisdiction), through collective bargaining with a labour union (obliges school to listen, but not act; strikes and demos become legal; access to union lawyer), and then through civil court, which was the only body able to judge or award damages. It all finally ended in a settlement 2 years later. Settlements are supposed to help both sides move on. At the end of the day, the school was not able to “dismiss” her based on “incompetency” because there had been no evidence submitted to warrant it–this was the most important thing Ms. Tran wanted to establish. As a result, the school’s dismissal of her didn’t stand, and Ms. Tran was serious about maintaining her teaching record coming into this mess, as she was leaving it. So, before the case ended, she asked the judge to get the school to re-issue her a letter of recommendation and they complied. Ms. Tran knew that the international school community was small, with long-time networks of former jet-setting teachers who keep in touch all over the world, for better or for worse, trading intel/gossip on teachers and schools. The hand-signed letterhead was not fail-proof, but it would provide interesting contrast in case a follow-up phone call with the school didn’t corroborate it! For her part, she was asked by the court to talk to “whoever it was” that ran this blog, to stop it. Since I ran the blog as a supporter in all this, and even if it was just a pre-condition to the settlement that I stop, I saw the fairness in it, and did. That was then! Ms. Tran had by then, moved onto teaching at universities in the Tokyo area. The university sector generally has part-time positions (paid by the number of courses taught) and if one wanted to make more money in the sector, one took on several courses at the same university, or several universities. Ms. Tran while suing the school, had been completing her Master’s Degree from the University of Toronto, which was the last qualification she needed to teach at universities in Japan. By November 2010, she had been holding down courses at three universities and felt she could take on a fourth. At the advice of one of her sempai, who was sure he’d be able to recommend her into a block of several courses at Aoyama Gakuin University, she applied to the school. That’s right: an administrator at St. Mary’s, despite a court order to stay quiet about the case, decided that attacking the teacher within the teaching industry would be a good strategy–because her teaching opportunities would be damaged, and she would never know why if it were done in secrecy. Who did they talk to? How many people did they talk to? Who knows. But this Gregory Strong accidentally went on record via email here, to show that this was a interesting game for him to play. He is the recruiter for a university, and clearly believed he had influence over Ms. Tran’s employer in this email, to follow his judgment, which was handed down to him by St. Mary’s. I’m writing this to let people at the school know what tactics were used. Strange isn’t it? (No, I don’t mean the ungrammatical letter written by an apparent English Department head). I mean, isn’t this petty? I have never met Gregory Strong, but I assume he is a grown man, and an adult even. I have also learned that he has never met Ms. Tran. Yet, what small-minded, petty, evil (?) person would write something that would undermine the livelihood of a person he doesn’t even know? Someone who would find it their personal job to spread unsubstantiated rumours for no one’s gain–just out of pure revenge on behalf of his friend at St. Mary’s. As if it were the mind of an attack dog, not a professional. Here, Gregory Strong seemed to rely on some personal network of “highly influential” employers in the teaching business to exact his power over the teacher’s fate. Classic delusions of self-importance and grandeur? Well, despite any intended importance it may have had, the email wasn’t received as Mr. Strong had hoped. Ms. Tran’s employer, who found the letter incongruous with reality and was put off that it seemed to encourage him to act on unfounded, unprofessional gossip, did the right thing: he let Ms. Tran know what was being said about her in the teaching industry. Teachers, this is a rare case when you’re let in on crucial intel on detrimental gossip about your life!! 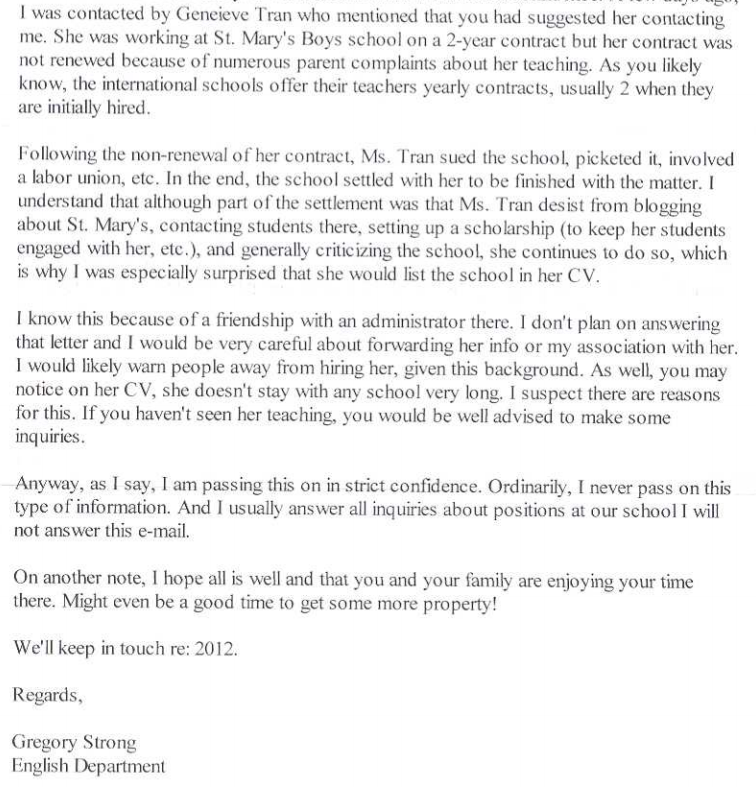 Ms. Tran also wanted to find out who Gregory Strong’s admin friend was at St. Mary’s–and what role this person might have had in defaming / breaching the settlement etc. Though it was entirely possible that Gregory Strong was an independent gossip, since he specifically implicated a St. Mary’s admin friend as his source of knowledge of the “settlement”, Ms. Tran’s lawyer opened the old case back up. Linda Wayne, the Curriculum Coordinator at St. Mary’s International School was the source of Strong’s defamatory ideas / settlement gossip about the teacher. Linda Wayne and Gregory Strong had apparently taught together in the ’90s at another international school, and surprise, formed some ever-lasting network of slave-owner-mentality folks who evidently took out their ________frustrations on others (*shudder). Linda Wayne had been one of two people who testified in the original unfair dismissal case (the other was the Business Manager). Good times, click here to read what she testified. She was also an admin involved in negotiating the settlement. Once this came out in court, Ms. Tran was totally unsurprised. It was merely a suspicion confirmed, folks. The vindictive spreading of lies, in secret, and encouraging others to participate in her ruin (the ruin of someone they didn’t like) was exactly what Ms. Tran had experienced throughout the whole ordeal with the school since she started working there. However, it was just very rare to able to confirm that something like this was happening. But there it is, teachers, parents, alumni, and students. There it is. Also, if I may add, this case must have caused an interesting tension between Gregory Strong and Linda Wayne, who had to cooperate to defend the school corporation–but were themselves the causes of this lawsuit happening. I wonder how that friendship is going? As well, Ms. Tran’s lawyers were union and public lawyers, who work, at most, inexpensively, to help social-cause cases. St. Mary’s private lawyers are slightly more expensive. I’m just thinking that the court fees in this thing for the school alone might have been a source of disappointment in Wayne and Strong, by the school corporation. After all, tight secrecy of ill deeds is usually sufficient to avoid being called-out in such an organization. Linda Wayne, I think, was just doing what she knew would be approved and supported by the school. Gregory Strong was a weak link, this time. Part 2? I warn that it will just contain mind-numbing incredulous-ness, that come from the Linda Wayne and Gregory Strong’s excuses in court. So….should we all be scared of St. Mary’s “power”? Well, let’s see: their “power” is apparently a network of unprofessional gossips who spread blacklists to remind themselves that they are in some kind of inner-circle. I’d doubt the professional ethics of “Collusion”. And they have friends like Gregory Strong. I mean, look at the way he writes! It’s incredible to imagine that in Japan, these individuals are at the top of their professions. Laughable. However, the amount of money they wasted from the school corporation’s funds to do all this should be a note to all parents, teachers, students and sponsors. I’d estimate that the school has spent at least 12-15 million yen reconciling their professional ethics in court with Ms. Tran, who challenges them every chance she gets. What could that money have gone to? Or maybe this is an expensive lesson that the school community has needed to go through. Or should I say, shocking “Bully” news? Hi There! It’s near the end of 2013. You’ll not believe what I have to write. Since the 2010 settlement between Ms. Tran and the school, as an insider at the school and supporter of what Ms. Tran was doing, I was asked to stop blogging about this “dead” issue. The school was itchy about this blog being up and had agreed to give her a letter of reference if I stopped. Though Ms. Tran had no control over the blog, in order to facilitate the signing of a confidentiality agreement, and an agreement to a settlement sum…and, because I didn’t want to interfere with her chances of becoming a Japanese millionaire (ha), I conceded. But what restraint it has been! Because a “dead” issue IT WAS NOT!!! Would you believe they have been in COURT all this time?! The teacher had found out, in a rare interception of an email, that an administrator at the school had been trying to ruin her chances of working within the university system after she left St. Mary’s. (“A school with a heart”. Really.) Although the school corporation had signed a confidentiality agreement in settling the case where Ms. Tran sued them, it appeared that one of their top admin, a woman heavily involved in the case, felt it necessary to badmouth Ms. Tran after the settlement, using her position in the school and inside knowledge of the case as credentials, to a 3rd party. Of course, she told the story of the settlement a way that was highly unfavourable to Ms. Tran (and highly favourable to the school—can you imagine Ms. Tran signing a settlement that sounded like that?!). Anyway, the admin had hoped to do it “confidentially”. But, too bad it got out, which surely was an embarrassment the school and its heroine administrator. So, Ms. Tran, using her special “St. Mary’s fund”, decided to take them back into court for breach of the settlement terms–and to find out, actually, who it was that would be so petty and evil. Who at St. Mary’s International School allowed this bullying to continue? Ms. Tran had zero tolerance with bullying among her students. She certainly wasn’t going to take this without saying something. Thus, this case was revived, like a zombie! If you are a member of the school community and always had a paranoia about whether the administrators would be the petty and evil sort if it really came down to dealing with a teacher or parent who crossed them, let this upcoming story tell you a story of…well, pettiness and evil. I have a LOT of reading, fact-checking and catching up to do before I write again. It will be soon. Cuz it would be FUN to name names, wouldn’t it? Now, here’s an interesting question: what sort of connections or tactics do you think the school would have to ruin a teacher’s name? On what scale do they work? 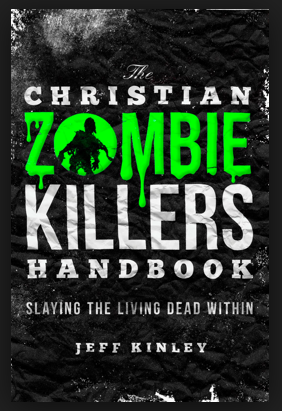 Wow, there’s a book for everything! Hello there! It has been ages since my last post. I had been hoping to leave this blog up to help anyone who needed to see what steps to take to fight an unfair dismissal. Though, reading back on some comments and letters, I wanted to tie up some loose ends. As well as comment on what, if anything, a big catastrophe like this earthquake could mean for foreign teachers. 1. Ms. Tran cannot be contacted through this site. Nor am I allowed to give information on the union she is part of. The school would have a lot of motivation to try to link them to this site and cry defamation…(or maybe just cry). But, as we know, WordPress is great at protecting freedom of speech. 2. Many have been unclear on what it was that Ms. Tran got out of the settlement. In an unfair dismissal case, people sue for their job back, or the equivalent of back pay. In Ms. Tran’s case, it was for the job and no amount of money was specified. However, in settlements, it is always money that finishes the case. Getting her job back would have been weird for everyone. 1. Thank you for continuing to stay in Japan. Your services are important for maintaining the level of education and economic progress of the country. Talk to your fellow teachers and employers about working together toward those goals. (An exodus of foreign teachers would be another huge setback for Japan, thus this is a time for teachers to recognize their worth). 3. This is an amazing time in Japan. It can be used to educate students on humanitarian issues and the concept of rebuilding Japan. Talk to your staff about incorporating this into your curriculum from here on in. Make your school, students and staff on the forefront of helping to donate, conserve energy and preparing students to live in a country that has undergone a heavy blow etc. This is the post-WW2 moment and kick-in-the-pants that complacent and stagnate Japan has been waiting for. The help of foreign workers, English, and a motivated young generation is what is needed to get back on track. You are needed more than ever–foreign teachers committed to staying in Japan should get together and recognize that you are an important force of redemption and rebuilding here!! The historic signing of papers finally happened today!! Stubbornness finally caved. So, while I assume the teacher is out to celebrate, I at least squeezed out an inventory list! 1. Meeting so many amazing people along the way who understand exactly why you must do something. Check. 2. Witnessing the magical helpful spirit of Japanese friends who translated hundreds of documents within days. Check. 3. MAKING the other side listen and LOOK at evidence–in Collective Bargaining, in court. Check. 4. Believing in self-determination and seeing it realized. Check. 5. Dragging the other side through years of time-loss, expense, publicity. Check. 6. 11,000 audited hits and counting. Check. 7. Being recognized by alumni and students who follow this thing in other parts of the world. Check. 8. Making a lasting impression. Check. 9. Learning from every moment. Check. 10. Getting to know the lovely maternal and paternal spirit of so many parents at St. Mary’s. Check. 11. Wiping the other side’s smugness up with the mop they gave you. Check! 12. Seeing karmic retribution kick BUTTS. (Though they [ahem] were rather hard to miss). Check and Check! …And although Richard Dawkins is right…I can’t help but say, God IS watching! The Old and New Testament God! And I like how He rolls His eyes at certain people, or at least pretends to sleep when they ask Him for things they don’t deserve. 😛 Awesome. Woohoo!!! Stay tuned for more posts. I ‘ve wanted to post a few more things…I’ll get my act together soon! Today, the teacher met with the school’s principal and business manager for what was supposed to be a final court meeting. It was a good thing Tweedle Dee and Tweedle Dum were left back at base camp. Though it is always fun to see them, weeble-wobbling down a hallway. So, the judge meets with each side individually to hammer out details. The other side has to wait outside the room. Good thing the teacher brought snacks and a friend to chat with for almost 3 hours! The teacher and the school are trying to come up with something that would sound dignified for all those involved. This is important in a settlement, especially for the party that needs to save face the most (that’s what settlements are all about). Pigs will always be pigs. However, death with some make-up can make it seem more pleasant for onlookers…but, it’s still…dead. Both sides will translate something into English and then have to agree on a translation. So, there is, yet ANOTHER court date: April 15th. Anyway, **!!! I heard that the teacher is double-checking her email list. If you have updated your email recently and / or as a supporting parent / student / teacher are interested in being included on the teacher’s updated list of supporting parent / student / teachers, don’t hesitate to be included!! You can send your email address here whenever you write a comment (you can just write a short comment, that I won’t post if you don’t want). Your email will be anonymous to the public, but I can see it. I will pass it on to her! I’m sure she is smart enough to BCC you in mass emails.So, I wonder if this has been meaningful to the teacher? Was the whole process the thing that was meaningful–3.5 years of dealing with these people/multi-celled organisms? Or does it all come down to one final moment, one settlement, one piece of paper? Without giving too much away, let me just say that there will be another court date on April 7, between the teacher and the school to discuss “thangz”. Unfortunately, because this was held in a stuffy tiny room, there won’t be space enough for any of us onlookers. But rest assured, I will find out some way, some how and let you know how things are going down. However this ends, if it ends, it needs to be done in a meaningful way. I’m sure the teacher wouldn’t have it any other way. Friday, March 26 at 15:45, on the 13th floor, in “bu” 19…. the case could end! But probably not. Apparently, the judge has asked the 2 sides to make some kind of out-of-court settlement before he hands down a decision. This is the second time the judge has made such a recommendation. The first time, the school opted not to settle and submit evidence instead [don’t know why they didn’t just submit evidence pro-actively to begin with 1 year into the court case. Perhaps they were waiting for the teacher’s visa to expire?–Then they wouldn’t have to do any work. But strangely enough, she still seems to haunt them in Japan!]. The evidence consisted of 27 character references for the Assistant Vice Principal, which did not mention the teacher at all. And negative letters by people who had all written positive things 3 years before. The next level is High Court, which has 3 judges, who attend court sessions together. This is also open to the public. “In the discussion that follows, I will be concerned primarily with the reformer who emerges from the lower hierarchy in an organization and challenges the middle hierarchy. A reformer threatens middle management in three distinctly different ways. 2. middle management recruited another middle manager and resorted to putting her in closed meetings with them to, as she feels, bully her goon-style, when she had pointed out #1. And then, since the teacher pointed THAT out, it snowballed from there until the point of her expulsion]. The second threat comes from the moral challenge presented by such a reformer, for [her] demand for action will reveal the strength or weakness of middle management’ commitment to the organization. O’Day, Rory. (1974). Intimidation Rituals: Reactions to Reform. Journal of Applied Behavioural Science.